A sprained ankle is a very common injury affecting over 20,000 people per day. A sprained ankle can happen to athletes and non-athletes, children and adults. It can happen when you take part in sports and physical fitness activities or simply if you step on an uneven surface, slip or fall. The ligaments of the ankle hold the ankle bones and joint in position and protect the ankle from abnormal movements such as twisting, turning, and rolling of the foot. A ligament is an elastic structure which stretches and contracts within limits. 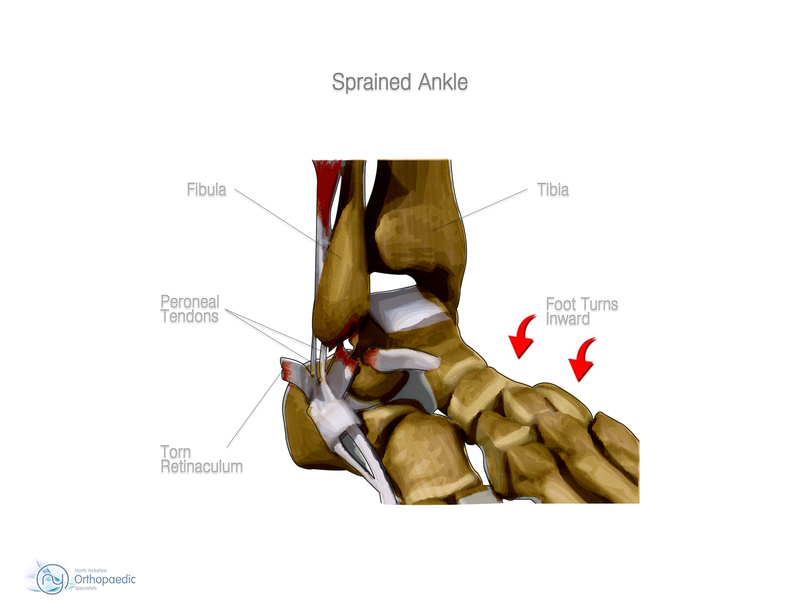 When a ligament is forced to stretch beyond its normal range, a sprain occurs. A severe sprain causes actual tearing of the fibres. The injury may cause you to loose footing or fall over and you may not be able to bear weight on the ankle. You may also hear a popping sound and see the inevitable swelling. Slight stretching and some damage to the fibres (fibrils) of the ligament. Complete tear of the ligament, causing gross instability. Your consultant will be able to easily diagnose a sprained ankle. An x-ray may be required to ensure that you don't have a fractured bone in the ankle or foot, which can exhibit similar symptoms of pain and swelling. The injured ligament may feel tender. If there is no broken bone, your consultant will be able to tell you the grade of your ankle sprain based upon the amount of swelling, pain and bruising. If there is a complete tear of the ligaments, the ankle may become unstable after the initial injury phase passes. If this occurs, it is possible that the injury may also cause damage to the ankle joint surface itself. Occasionally it may be necessary for an MRI (magnetic resonance imaging) scan to provide a detailed diagnosis of the injury. Walking may be difficult because of the swelling and pain. You may need to use crutches if walking causes pain. Usually swelling and pain will last 2-3 days. Depending upon the grade of injury, your consultant may tell you to use removable plastic devices such as castboots or air splints. Most ankle sprains need only a period of protection to heal. The healing process takes about 4-6 weeks. Your consultant may tell you to incorporate motion early in the healing process to prevent stiffness. Motion may also aid in being able to sense position, location, orientation and movement of the ankle (proprioception). Even a complete ligament tear can heal without surgical repair if it is immobilized appropriately. Even if an ankle has a chronic tear, it can still be highly functional because overlying tendons help with stability and motion. For a Grade 2 sprain, the RICE guidelines can also be used. Allow more time for healing to occur. You may also use a device to immobilize or splint the ankle. A Grade 3 sprain can be associated with permanent instability. Surgery is rarely needed. A short leg cast or a cast-brace may be used for 2-3 weeks. Your consultant will look inside the joint to see if there are any loose fragments of bone or cartilage, or part of the ligament caught in the joint. Your consultant will repair the torn ligament with stitches or sutures, or use other ligaments and/or tendons found in the foot and around the ankle to repair the damaged ligaments. Specific surgical methods and associated risks are described in relation to treatments and will be discussed with you on an individual basis. You will be fit to go home soon after the operation, normally on the same day. Simple analgesia (pain relief) usually controls the pain postoperatively and will be advised on discharge. The foot should be elevated as much as possible for the first 5 days. Gently bend and straighten the ankle joint from day 1.